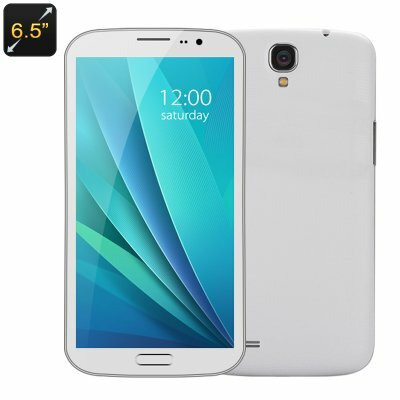 Successfully Added 6.5 Inch Android Smartphone - FHD 1080p IPS Display, MTK6589 Quad Core CPU, 1GB RAM, 16GB Memory, Dual SIM, 13MP Rear Camera to your Shopping Cart. This large screen phone takes viewing seriously - it offers a full HD 1080p visual feast on a huge 6.5 inch screen. This means you can enjoy cinematic entertainment or get truly immersed in games. The large screen is better for every aspect of your daily phone use be it writing messages, surfing the web, watching movies, playing games or reading a book, they are all so much easier with a large crystal clear screen. Despite its large screen this phone can be held in one hand thanks to its slim body and curved back that ensure this Phablet feels great and is easy to hold. Beneath that expansive display lays a proficient MTK quad core CPU backed up by 1GB of RAM. This will power the phone to meet all your needs and offers a superb performance for your movies, games and multitasking. With the popular Android OS you get a familiar friendly interface with access to all the latest apps through the Google Play Store. This Smartphone is an all round winner, with two SIM card slots you can manage multiple phone numbers and keep connected to work and personal contacts all on the one device, so you needed carry multiple phones around with you and will never need miss a call again. Having 16GB of built in memory and apple room for expansion with a micro SD card you can will never need worry about running out of storage space. so no matter you needs there’s plenty of room for work files, games, movies and music to keep you entertained for hours. The phone comes with two cameras that will bring out the photographer in you as they support 5MP and 13MP photos respectively and you can even capture FHD video as well.